I should buy more flowers from Costco. I've finally figured it out. My Nashville Costco has three types of bouquets: Premium Floral Bouquets for $14.99, 24 Stem Rose Bouquets for $16.99, and Garden Bunches for $8.99. In the past, the large bunches have overwhelmed my house. I tried dividing the bouquets and making four separate arrangements out of the mixed flowers, but so many different small bouquets looked disorganized and busy. My house is busy enough without adding more. 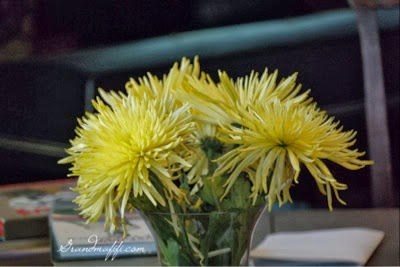 The smaller $8.99 garden bunch is usually one variety of flower; which I thought might look odd, but I tried the spikey yellow chrysanthemums. 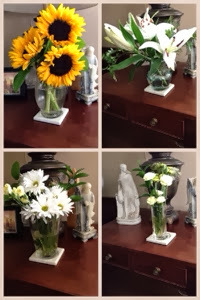 I divided the chrysanthemum garden bunch between two low, hand-blown glass vases on my dining room table. Because the flowers are one color and shape, the look isn't busy, and the simple addition of fall flowers makes the table more warm,welcoming, and seasonal. The chrysanthemums have lasted ten days; they're almost over now. I'm going to try to keep this look going by grabbing a different garden bunch next time.